The Easy Setup Key is a USB flash drive that basically keeps a record of the settings on your Linksys X-series Gateway or Linksys Wi-Fi Router. Disconnecting the Easy Setup Key from your computer without properly ejecting it may cause data loss or even physical damage to your equipment. This article will show how you can safely eject your Easy Setup Key from your Windows or Mac® computer. Use the Safely Remove Hardware option of your Windows computer to safely eject your Easy Setup Key. Press the Windows key + D on your keyboard to show the computer’s desktop view. 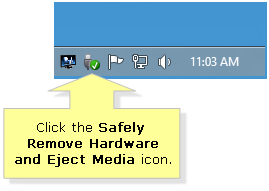 Click the Safely Remove Hardware and Eject Media icon located at the bottom-right corner of your screen. From the list of connected devices that would appear, select Eject Easy Setup Key. NOTE: A Safe To Remove Hardware prompt should appear on your screen above the Safely Remove Hardware and Eject Media icon. Unplug your Easy Setup Key from the USB port on your computer. Use the Safely Remove Hardware option in Windows 7 or Windows Vista to safely eject your Easy Setup Key. Double-click the Safely Remove Hardware icon located at the bottom-right corner of your Desktop. NOTE: If you have multiple USB flash drives connected to your computer, make sure that you select the correct device. If you're unsure, you can go to Start > Computer and check what drive letter is assigned to your Easy Setup Key. A Safe To Remove Hardware prompt should appear on your screen above the Safely Remove Hardware icon. Use the Safely Remove Hardware option in Windows XP to safely eject your Easy Setup Key. Click the Safely Remove Hardware icon located at the bottom-right corner of your Desktop. From the list of connected devices that would appear above the Safely Remove Hardware icon, select your Easy Setup Key by clicking on it. NOTE: If you have multiple USB flash drives connected to your computer, make sure that you select the correct device. If you're unsure, go to Start > My Computer and check what drive letter is assigned to your Easy Setup Key. Click the Safely Remove Hardware icon again and make sure that your Easy Setup Key is no longer listed. Once your Easy Setup Key disappears from the list, unplug it from the USB port on your computer. 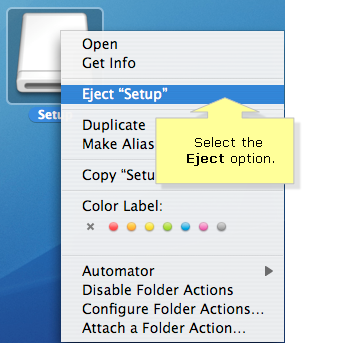 Use the Eject option on your Mac to safely eject your Easy Setup Key. Click the Easy Setup Key icon and press the Command button on your keyboard. NOTE: The Easy Setup Key will be displayed as white-colored icon. Its volume label will be displayed below your Desktop. From the menu, select the Eject option. NOTE: Alternatively, you can also drag the Setup icon to the Trash icon on your Object Dock. 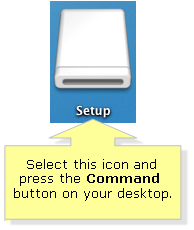 Once the icon for your Easy Setup Key disappears from your Desktop, you can then unplug your Easy Setup Key from the USB port of your Mac computer.